Best wishes to the kid Jesse who crashed Sunday, get well! A huge congrats to "Tiny TYRANT" Brandon Begin for taking home 2nd in the Amateur Comp today. 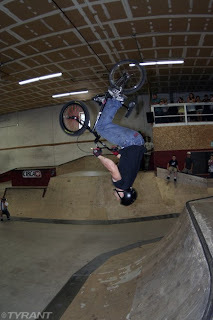 Tiny went big...love that pedal grind to 270 to mega-long fakie rollback to barspin out! Jake Lineberry landed a dialed 720 over the box and this rad fakie flip in the expert comp! CLICK HERE FOR TONS OF PHOTOS!! !